• First Zambian finalist in the DStv Eutelsat Star Awards, Francine Mazala (left) with Multichoice public relations manager Marlon Kananda. 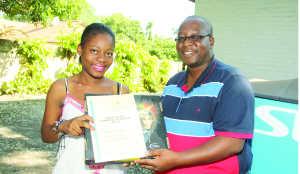 Zambia’s 17-year-old, grade 12 pupil of Mpelembe Secondary, Francine Ngonya Mazala has become the first Zambian student to make it to the finals of the prestigious DStv Eutelsat Star awards that were hosted in Accra Ghana on Wednesday February 5, 2014. 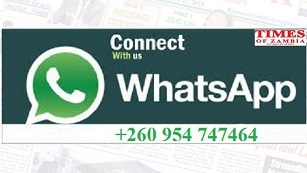 “2013 to 2014 has just been so good for Zambia… Look at how we faired in the Big Brother game with Sulu and Cleo, look at the Zone Fam wining a prestigious award, again we have three nominees for the prestigious Africa Magic Viewers Choice Awards from Love Games and now we have a Zambian finalist in the DStv Eutelsat Star awards… I feel like jumping!” Said Marlon. The DStv Eutelsat Star Awards, is a student competition which now draws over a 1000 entries across the continent and encourages students to either write an essay or design a poster about the benefits of satellite technology in the continent. Meanwhile, the Ghanaian government pledged to put its weight behind the third edition of this unique event after it confirmed Minister of Education, Honourable Naan Opoku-Agyeman as guest speaker at the prestigious Gala Dinner that was held at the Golden Tulip Hotel in Accra on the 5th February. In the spotlight for the final prize were finalists from 13 countries in Africa, namely Shiela Gerardo (Angola); Ulathi Mkwebu (Botswana); Maame Akua Kome (Ghana); Lavine Oluoch (Kenya); Michael Kauatjitotje (Namibia); Taiwo Kayode (Nigeria); Kanzira Aine (Senegal); Eshlin Vedan (South Africa); Wakhile Shongwe (Swaziland); Fransisco Kibasa (Tanzania); Victor Okoth (Uganda); Francine Mazala (Zambia) and Thabani Sibanda (Zimbabwe). When the organisers, MultiChoice Africa and Eutelsat set their sights on Accra for the Awards they collaborated to create meaningful engagement with students, the academic community and the scientific world in orderto leave a lasting legacy in the hearts and minds of the young people of Ghana and to instill a passion for science in the younger generation. Students in Accra were privileged to attend a captivating lecture delivered by the Italian (European Space Agency) astronaut, Paolo Nespoli on Tuesday, the 4th February which will be held at the University of Ghana. Nespoli, who also presided over the Awards as Jury chairperson assisted by a panel of skilled industry experts, shared his adventures in space with his first flight in 2007 and a second long-duration mission on board the International Space Station in 2010. In his support for this initiative, CEO of MultiChoice Africa, Nico Meyer said: “As a business, we understand the incredible value of collaborative relationships with governments and the returns yielded by communities when public and private sectors come together. We are very pleased by the government’s overwhelming support for the DStv Eutelsat Star Awards initiative and we are honoured to also have the Minister of Environment, Science and Technology, Honourable Joseph Oteng-Adjei scheduled to address Ghanaian students at the outreach lecture. Chairman and CEO of Eutelsat, Michel de Rosen commented on the far-reaching impact of the Awards over the last 3 years. “The number of entries received this year is a truly encouraging new milestone. Equally exciting is the turnout of young people in great numbers at the student outreaches held in local communities. It is an excellent indicator that Africa’s young minds are hungry to acquire knowledge and skills that will position them a cut above the rest. At Eutelsat, we are keenly aware that there can be no sustainable development in high technology environments without engineers, technicians and teachers to propel and stimulate young minds to the next stage.